This face and body moisturiser is designed to keep skin moist, firm and ageless with the powerful plant-based hyaluronic acid to prevent trans-epidermal water loss. 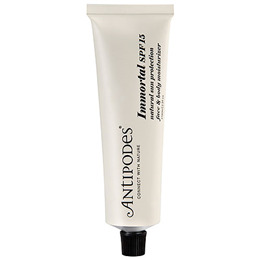 This moisturiser comes enriched with a sun protection factor of 15. Meanwhile, super-antioxidant Vinanza Grape & Kiwi helps decrease the appearance of redness. Moisture levels are boosted and your skin kept firm and flawless thanks to powerful, plant-based hyaluronic acid. Ancient Reishi mushroom of immortality enhances cell turnover for an ageless, healthy visage. Aqua (water), zinc oxide & caprylic/capric triglyceride, polyhydroxystearic acid & isostearic acid, Prunus dulcis (sweet almond) oil, Prunus armeniaca (apricot) oil, glycerin, cetearyl glucoside & cetearyl alcohol, glyceryl stearate, Simmondsia chinensis (jojoba) oil, Vitis vinifera & Actinidia chinensis (Vinanza Performance Plus® Grapeseed & Kiwifruit seed) extract, hyaluronic acid, Rubus idaeus (raspberry seed) oil, Punica granatum (pomegranate) extract, Gandoderma lucidum (Reishi mushroom) extract, xanthan gum, gluconolactone, sodium benzoate, calcium gluconate, tocopherol (Vitamin E). Use Immortal as a light daily moisturiser. First rub between your fingertips or palms to warm, which will help disperse Immortal evenly on your skin. Gently massage in upward circular movements over your face, and apply to all the exposed parts of your body. Below are reviews of Antipodes Face and Body Moisturiser SPF 15 - 60ml - Best before date is 30th June 2019 by bodykind customers. If you have tried this product we'd love to hear what you think so please leave a review.